Last year, food editor Shawna Wagman wowed us with a top 10 restaurants list that celebrated smaller, more casual restaurants that served top-notch cuisine. Turns out we weren’t the only ones impressed. Up against the top magazine writers from across the country, Wagman earned a silver medal for that feature last June at the National Magazine Awards. So settle down and enjoy Wagman’s beautiful writing (I challenge you not to salivate as you read her descriptions of some of the dishes) and trenchant analysis of the local restaurant scene circa 2011. Then get out there and reward the restaurants that are doing such a brilliant job of making dining out a true pleasure. 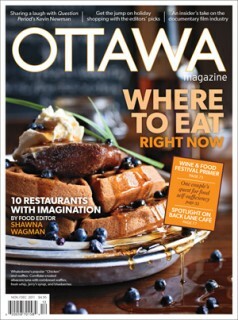 Kudos also go out to photographer Photolux Studio’s Christian Lalonde, the man behind the cover shot and the 10 mouth-watering dishes showcased in Wagman’s feature. Up on the latest food photography trends, Lalonde always helps us develop innovative ways to showcase the city’s chefs and their creations. This year, we love how the ingredients of so many of the dishes have become an integral part of the photographs. Bon appétit! COMING UP: Back by popular demand, the annual Interiors issue hits the newsstands in mid-January with five featured homes that showcase the ingenuity (and impeccable taste) at play in the capital. From a thoughtful modern renovation undertaken step by step over more than a decade to an innovative infill that took mere months to build, we’ve got inspirational ideas for every budget.